Designates the start or destination of a hypertext link. Provides a toolbar for displaying app-specific commands. Specifies the sound or audio content, such as music or effects, to be played in a document. Provides backwards navigation in the form of a button. Provides an object that is used for drawing, rendering, and manipulating images and graphics on a document. 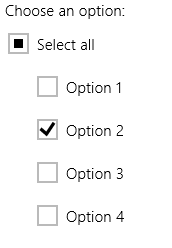 Represents a check box that a user can select and clear. See the entry for "select". Shows critical information that requires attention or explicit action from the user and temporarily blocks interactions with other elements in the app. Provides a lightweight menu that gives users access to actions (like clipboard commands) on text or UI objects in Windows Store apps. A single line entry control that accepts one or more email addresses. Creates a file upload object with a text box and a browse button. Defines a layout in that takes the available space into account when defining box dimensions, which enables relative sizes and positioning. Displays a collection, one item at a time. A CSS layout that defines a flexible grid area that consists of columns and rows. A ListView that has a grid layout. See the entry for "list view" for more information. Displays content from an HTML page. Creates a hub navigation pattern consisting of sections that can be navigated to. Each section is defined by a hub section. Defines a section of a hub. See the entry for "a". An inline floating frame that can display another document. See the entry for "semantic zoom". Specifies a label for another element on the page. Displays a collection of data in a list or grid layout. See the entries for "audio" and "video." Represents a command to be displayed in a Menu object. Displays a message that requires an immediate user response. See the entry for "textarea". Displays navigation commands in a toolbar that the user can show or hide. Represents a navigation command in a navigation bar container. Contains a group of navigation bar commands in a navigation bar. A single line entry control that accepts a numeric value. Represents a custom control or a page in an a navigation app. See the entry for "scroll view". A single-line text entry control similar to the text input control, except that text is not displayed as the user enters it. Creates a tab within a tab control. See the entry for "context menu". Displays a bar that indicates that work is in progress. Indeterminate ring is unsupported on Windows Phone 8.1. Displays a ring that indicates that work is in progress. See the entry for "button". A type of selection control that limits a user's selection to a single value within a set of values. To do this, you must link together each button in a set of radio buttons by assigning each button the same name. See the entry for "slider". Enables the user to rate something or view its existing rating. Generates HTML from a set of data. Use this control to generate lists of items. Resets data in a form. A control that provides text input functionality that resembles a text input box but can handle content that contains child elements. To create a rich text box, you set the contentEditable property of the elements that you want to edit. A container that enables you to scroll through its contents. You add this scrolling functionality by adding the setting the overflow style of an element to scroll or auto. Displays a view of content a user can zoom in and out of, and provides additional features, such as snap points, that enhance that experience. Enables the user to perform search queries and select suggestions. Represents a list box, combo box, or drop-down list. Enables the user to zoom between two views of a collection of items. Provides access to app settings. See the entry for "text box". Provides a range slider for selecting a numeric value. Splits an area into two parts: a pane that can appear from an edge and a content area that fills the available space. Creates a button that, when clicked, submits the form. Defines an SVG document or document fragment that can render vector graphics. A single-line text entry control. A multi-line text entry control. Lets the user specify a time. Displays a set of commands. A Toolbar can appear in any location, including in a Flyout or an AppBar. Displays a rich tooltip that can support rich content (such as images and formatted text) to show more information about something. Displays a simple, text-only tooltip for an element. A single-line text entry control that accepts URLs. Specifies the video content to be played in a document. Scales a single child element to fill the available space without resizing it. This control reacts to changes in the size of the container as well as changes in size of the child element. For example, a media query may result in a change in aspect ratio. See the entry for "iframe".